Objective: To explore the clinical effects of posterior microendoscopy discectomy and open surgery on lumbar disc herniation. Methods: A total of 97 patients with lumbar disc herniation treated in our hospital from January 2017 to August 2017 were selected as the research objects followed by being randomly divided into microendoscopy discectomy group (n=43) and open surgery group (n=44) with the method of drawing lots in which the open surgery group were given open surgery while the discectomy group received posterior microendoscopy discectomy (MED) treatment. Then operation conditions, VAS score, JOA, ODI score and recurrence rate were compared between the two groups. Results: After treatment, there were significant differences in operation conditions, VAS score, JOA, ODI score and recurrence rate between the discectomy group and the open surgery group, P<0.05. Conclusion: Posterior discectomy is more effective in the treatment of lumbar disc herniation and is worthy of clinical application. LDH mainly refers to the damages of annulus fibrosus and nucleus pulposus spillover caused by the degeneration of the intervertebral disc and is generally given conservative treatment in clinical trials followed by surgery when the treatment is invalid and the surgical treatment is divided as traditional fenestration as well as MED treatment unceasingly which has been effectively carried out in recent years . The physiological structure in patients with LDH experiences degenerative changes, then constricts the nerves and affects normal function. LDH is pathologically classified as protruded type, extruded type, sequestered type and Schmorl's nodule with its confirmed diagnosis methods including CT, MRI and X-ray film etc. LDH usually occurs in young adults aged 20-40 with far higher incidence in men than in women and the patients have main manifestations of low back pain and unilateral as well as bilateral radioactive melosalgia. Related data showed that in patients there are more than 90% suffering from lower lumbar disc herniation and the L4-5 disc herniation is most common the proportion of 60%. LDH patients are often accompanied with hyperosteogeny, decrease of muscle strength and long-term pain in the legs and numbness of the extremities. It has long duration with protracted course of disease, which causes great distress to the patient's daily life, so the issue of how to improve the disease condition and quality of life in patients has drawn extreme attention from relevant staff. The traditional surgical treatment has many disadvantages, such as large incision, bleeding and slow healing, which is not conducive to the prognosis of patients. As the medical technology continues to make progress, posterior microendoscopy discectomy has been extensively applied in clinical practices with remarkable effects. In this research, we selected 97 patients with lumbar disc herniation who were treated in our hospital from January 2017 to 2017 August to deeply study clinical effects of MED treatment and open surgery on lumbar disc herniation. A total of 97 patients with lumbar disc herniation treated in our hospital from January 2017 to August 2017 were selected as the research objects followed by being randomly divided into microendoscopy discectomy (MED) group (n=43) and open surgery group (n=44). In the (MED) group there were 22 males and 21 females aged 48-75 with an average age of (61.5 ± 1.7) years, including 15 right type protruding, 14 left type protruding and 14 central type protruding; while in the open surgery group there were 18 males and 21 females aged 47-76 with an average age of (61.5 ± 1.6) years, including 18 right type protruding, 13 left type protruding and 13 central type protruding. The difference between the two groups in baseline data was not significant with good consistency (P>0.05). 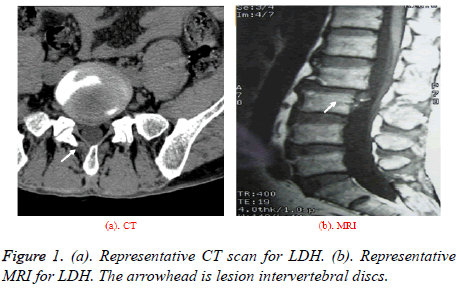 Inclusion criteria: (1) all patients were diagnosed as LDH suffers by CT and MRI (Figure 1); (2) all patients were treated conservatively for more than 3 months but with minimal effect. (3) the course of disease ranged from 0.5 to 10 years . Exclusion criteria: (1) patients had surgical contraindications; (2) patients had previously undergone surgical treatment; (3) patients were suffering from spinal stenosis . The open surgery group were given open surgery with following specific steps: patients took prone position followed by epidural anesthesia, in brief, epidural puncture was performed in 1 and 2 lumbar intervertebral space and to control the level of anesthesia in T10 and kept maintenance of anesthesia with ropivacaine during operation. The doctor in turn cut skin, subcutaneous lumbodorsal fascia and periosteum to directly reach vertebral plate, which was controlled by rongeur forceps, then the ligamentum flavum was found followed by being removed to fully expose epidural fat and dural sac, next the intervertebral disc was found followed by being removed with nucleus forceps to observe if there was threshed mixture, when there was no abnormalities, the incision was sutured and drainage tube placed with incision covered by sterile gauze [4-6]. The microendoscopy discectomy (MED) group were treated by MED with following specific steps: patients took prone position followed by epidural anesthesia, then the Kirschner wire-7 was inserted 0.5 cm from the posterior median line of lumbar vertebra in patients to reach lower edge of the lamina, the diseased intervertebral space was determined by X-ray of the C type wall and an incision of 1.8 cm was made after location, then the tube with extended surface was pushed to intervertebral space followed by placement of channel tube and finally fixed with free hand. At this time, the endoscope enables to remove superficial tissues and gradually expose diseased intervertebral discs with the help of light and video monitors through the channel tube, then the fiber ring was cut, into which the nucleus forceps was stretched to remove the intervertebral disc and nucleus pulposus tissue, when there was no bleeding, the channel tube was extracted and fibrin sealant was injected followed by placement of drainage tube with incision suture after the end of operation [7-10]. The key steps of the operation were shown as following figures: incisionmaking (Figure 2) - separation (Figure 3) - removal (Figure 4). Figure 1: (a). Representative CT scan for LDH. (b). Representative MRI for LDH. The arrowhead is lesion intervertebral discs. Figure 2: (a). 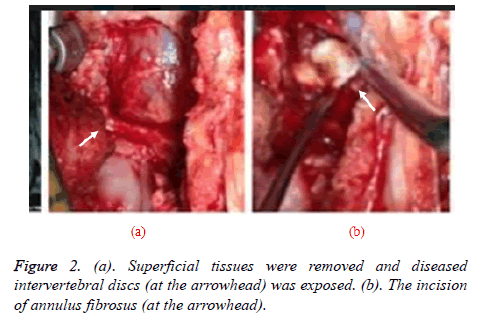 Superficial tissues were removed and diseased intervertebral discs (at the arrowhead) was exposed. (b). The incision of annulus fibrosus (at the arrowhead). Figure 3: The nucleus forceps was stretched to separate the intervertebral disc and nucleus pulposus tissue (at the arrowhead). Figure 4: (a, b). Vertebrae were fixed. (c).The tissues cut off were removed (at the arrowhead). Observation index: operation conditions, VAS scores, JOA, ODI scores, and recurrence rates. Evaluation criteria: (1) operation conditions included: length of incision, operation time, amount of bleeding as well as amount of ligamentum flavum and lamina bite; (2) the VAS scores(pain) included: pain of back and leg, which was measured by visual analogue scale; (3) JOA, ODI scores were respectively conducted by lumbar JOA scale and oswestry disability index score scale; (4) the recurrence rate was conducted with statistical analysis after a follow-up of patients for 18 months after surgery [11-12]. The statistical software version SPSS20.0 was used for the analysis. The measurement data including operation conditions, VAS score and JOA, ODI scores were described as (͞x ± s) and checked by t test while the recurrence rate, as the count data, was expressed as “n,%” and checked by x2, P<0.05 suggested there was significant differences of statistical value between groups. After treatment there were significant differences in the length of incision, the operation time, the amount of bleeding as well as the amount of ligamentum flavum and lamina bite between the MED group and the open surgery group, P<0.05, as shown in Table 1. Table 1. Comparison of operation conditions between the two groups (͞x ± s). Before operation, there was no significant difference in the scores of back and leg pain P>0.05, while after operation the scores of the MED group were significantly lower than those of the open surgery group, P<0.05, as shown in Table 2. Table 2. Comparison of VAS score between the two groups (͞x ± s). Before operation, there was no significant difference in the JOA and ODI scores, P>0.05, while after operation the scores of the MED group were significantly better than those of the open surgery group, P<0.05, as shown in Table 3. Table 3. Comparison of JOA and ODI scores between the two groups (͞x ± s). The results of 18-month follow-up showed that the recurrence rate was 2.33% in the MED group and 15.91% in the open surgery group with significant difference in between, P<0.05, as shown in Table 4. Table 4. Comparison of recurrence rates between the two groups. External forces lead to changes in intervertebral discs with the failure of balance and when LDH occurs, the fibrous ring would be ruptured, making the nucleus pulposus protrude to the fiber ring, thereby compressing backbone, blood vessel as well as nerve root and finally resulting in pain of back and leg . This study shows that after treatment. there were significant differences in the length of incision, the operation time, the amount of bleeding as well as the amount of ligamentum flavum and lamina bite between the MED group and the open surgery group, P<0.05, and after operation the scores of the MED group were significantly lower than those of the open surgery group, P<0.05; and the recurrence rate was 2.33% in the MED group and 15.91% in the open surgery group with significant difference in between, P<0.05; and after treatment the JOA, ODI scores of the MED group were better than those of the open surgery group but with insignificant difference, P>0.05. The specific reasons are: there is no significant difference between the two surgical methods in the JOA and ODI scores, but MED treatment has the advantages of small incision, accurate lactation of lesion, less bleeding, rapid postoperative recovery and low recurrence rate. It enables to clearly observe the anatomical structure of the intervertebral disc under endoscopic and find intraspinal lesions, which significantly decreases the damages to dural matter as well as nerve and reduces the incidence of complications while ensuring operation effect; Moreover, it can ensure integrity of spinal posterior ligament and reduce the removal of ligamentum flavum as well as the formation of scar tissue; MED treatment, as the world's advanced surgical measures, is conducted with imported equipment, which protects the treatment safety and facilitates the restoration in LDH patients [14-15]. Therefore, MED treatment is feasible and it opens a new way for LDH treatment and meanwhile improves the patients’ quality of life to some extent. In summary, MED is more effective in treatment of intervertebral disc herniation and has the advantages of small incision, less bleeding, shorter operative time, relieved postoperative pain, and low recurrence rate, thus worthy of clinical reference and adoption. Greiner-Perth R, Böhm H, Allam Y. A new technique for the treatment of lumbar far lateral disc herniation: technical note and preliminary results. Eur Spine J 2003; 12: 320-324. Eun S, Lee S, Hun S, So-Young P. Surgical Treatment of T1-2 Disc Herniation with T1 Radiculopathy: A Case Report with Review of the Literature, 2012. Qing-Guo L, Zhi-Bin S, Jian-Wei G. Microendoscopic discectomy versus microscopic discectomy for treatment of lumbar disc herniations: A systematic review of randomized controlled trials. Chinese J Contemporary Neurol Neurosurg 2013. Guterl CC, See EY. Challenges and strategies in the repair of ruptured annulus fibrosus. Euro Cell Material 2013. Anne H, Jens B, Lars G. Prognostic factors for non-success in patients with sciatica and disc herniation. BMC Musculoskeletal Disord 2013. Fabrizi AP, Maina R, Schiabello L. Interspinous spacers in the treatment of degenerative lumbar spinal disease: our experience with DIAM and Aperius devices. Eur Spine J 2011; 20 Suppl 1: S20-26. Park MK, Kim KT, Cho DC, Sung JK. Surgical Tips to Preserve the Facet Joint during Microdiscectomy. J Korean Neurosurg Soc 2013; 54: 366-369. Vialle R, Court C, Khouri N, Olivier E, Miladi L, Tassin JL, Defives T, Dubousset J. Anatomical study of the paraspinal approach to the lumbar spine. Eur Spine J 2005; 14: 366-371. Jun-Jun H, Lian-Shun J, Xiong-Sheng C. Clinical features and surgical treatment of cauda equina schwannoma. Med J Chinese People's Liberation Army 2013. Moatz B, BradleyT, Justin P. Transforaminal lumbar interbody fusion and posterior lumbar interbody fusion utilizing BMP-2 in treatment of degenerative spondylolisthesis: neither safe nor cost effective, 2013. Nuraliev K. Orthopedic aspects of surgical treatment of the patients with lumbar osteochondrosis. Med Health Sci J 2013. Gouse M, Amritanand R, Venkatesh K, Sundararaj GD. Recurrent Echinococcal Infection of the Lumbar Spine: An 11 Year Follow-up. Asian Spine J 2013; 7: 39-43. Violaris K, Karakyriou M. Presentation of a rare case of bilateral lumbar synovial cysts. Open J Mod Neurosurg 2013. Son ES, Lee SH, Park SY, Kim KT, Kang CH, Cho SW. Surgical treatment of t1-2 disc herniation with t1 radiculopathy: a case report with review of the literature. Asian Spine J 2012; 6: 199-202. Wang JC, Dailey AT, Mummaneni PV. Guideline update for the performance of fusion procedures for degenerative disease of the lumbar spine. Part 8: Lumbar fusion for disc herniation and radiculopathy. J Neurosurgery Spine 2014; 21: 48-53.